The Born This Way singer, 31, split from her boyfriend of five years Taylor Kinney last year (16), but has since started dating Christian, a 48-year-old Hollywood agent, in February. 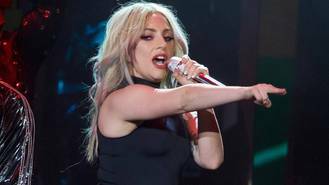 According to editors at the NewYork Post's Page Six gossip column, the star, real name Stefani Germanotta, broke off from a rendition of her hit Bad Romance at her Manhattan concert last week (end3Sep17) to praise her new beau and explain to fans she was in love. "When I went backstage, Christian was by the stairs making sure I was OK," the singer said at the gig. "The best part about being in love with someone is having them there to catch you if you fall." Insiders tell the newspaper that the pair are "totally inseparable" and that the talent agent recently attended a party held for Gaga's mother, Cynthia Germanotta. Gaga cancelled a concert in Montreal, Canada on Monday (4Sep17) due to illness. It has been an emotional week for the singer as on Saturday (2Sep17) during her concert in Boston, Massachusetts she paid tribute to her acting coach Elizabeth Kemp, who passed away after battling cancer. She was told of her acting tutor's death just before going on stage by her co-star in forthcoming movie A Star is Born, Bradley Cooper, who was mentored by Elizabeth. "Bradley texted me before the show to tell me that our friend had lost her life to cancer," she told fans, adding, "What Bradley told me was that Elizabeth died with such dignity. She knew she was going to go but he told me it was very graceful." Her Joanne world tour continues in Toronto, Canada on Wednesday (6Sep17).